Apple iphone 5 charger cable is housed within premium aluminum housing for safe and reliable charging . Features an ultra-durable nylon-braided jacket with a bend lifespan of 6000+ and seamlessly molded joints. Apple iphone charging cord is well made with smooth double - braided Nylon that could protect wire cores and resists kinks. Our cables are still sturdy and strong. 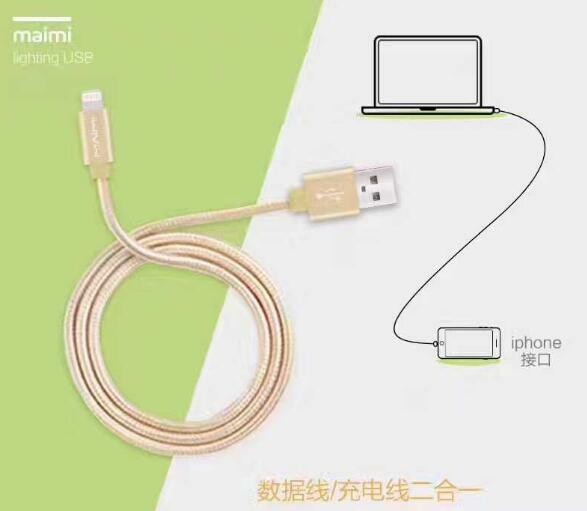 The cord is also tangle free and flexible which makes your life more convenient . Braided lightning cables are considerate on preparing the cables for where you may stay every day. Workplace,office,home,bedroom,car,the way of the journey, etc. Premium compact, heat-resistant aluminium connector makes it easy and secure to connect your devices. Braided Lightning Cables with its braided ballistic nylon covering keeps it strong and prevents fraying even with intense use. Looking for ideal Apple Iphone 5 Charger Cable Manufacturer & supplier ? We have a wide selection at great prices to help you get creative. All the Apple Iphone Charging Cord are quality guaranteed. We are China Origin Factory of Braided Lightning Cables. If you have any question, please feel free to contact us.